If you are in business for more than 150 years, you must be doing something right. But to stay competitive, you still need to learn and improve. Bassetts Ice Cream is widely regarded as the oldest ice cream company in the United States. In Philadelphia’s Reading Terminal Market, where family businesses make up nearly half the stalls, Bassetts is the only original tenant; the ice cream maker has been there since 1892. 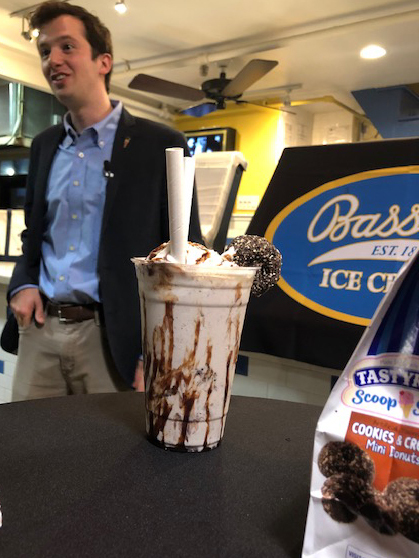 In addition to the scoop shop, Bassetts has a catering arm and sells its products wholesale. The sixth generation — cousins Eric Bassett, director of catering operations, and Alex Bassett Strange, vice president of distribution — are now working in the business. The fifth-generation leaders are their uncle, president and CEO Michael Strange, and Eric’s father, Roger, who is general manager of retail operations. As the weather warms, Alex says, the business makes improvements that were planned in the off-season. Recent updates include smartphone ordering and payment so customers don’t have to stand in line. Also, the milkshake area has moved to the end of the space so people can more easily watch the shakes being made. This also helps ease traffic in front of and behind the counter. This is also the time to introduce new flavors. A new milkshake this season is a cookies-and-cream mini-donut flavor. Bassetts teamed up with another Philadelphia icon, Tastykake, to launch its new product line, Scoop Shop. The Tastykake donuts and flavors are incorporated into a massive shake garnished with a donut. Alex and Eric were the family representatives on hand recently during the launch of both the milkshake and the donuts. Over the years the family business has also introduced a 5K race in which runners eat a pint of ice cream at the halfway point and an ice cream festival that brings other makers to Reading Terminal Market for a daylong event.